Scarlette Tipton, 2 years old, was born with a rare form of cancer, she lost her left arm because of the disease. Doc, the kitten, was only three months old when she suffered a ‘catastrophic’ injury to one of her front legs, and it was amputated. As fate would have it, Scarlette and Doc were going to meet and become BFFs! Scarlette noticed the staples on the kitten and seemed to understand that she had a lot in common with the tiny kitten. The two share a special bond that most of us will never understand. 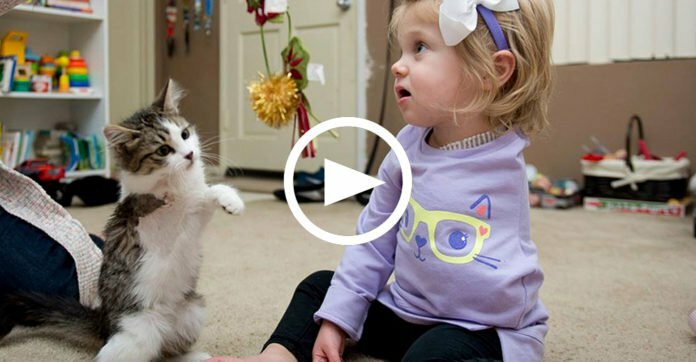 Watch the video below, prepare yourself, it may make you tear up a little! What we can understand is the love they share and how important it is that they have each other. They will be able to grow up together and have each other for a very long time.